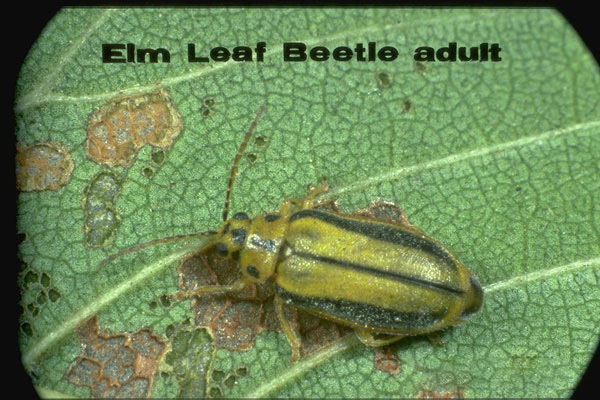 Adult beetles overwinter, normally in leaf litter, crevices in the bark, and other protected places, but very commonly they will enter structures in the fall and overwinter in voids. 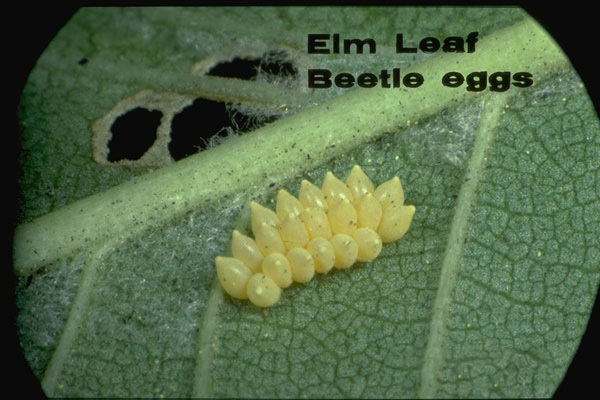 Females deposit eggs in small clusters on the foliage of elm trees in the spring. After several weeks of feeding the larvae crawl down the trunk and pupate in or on the soil below the tree. There may be up to 3 generations per year in warm climates. 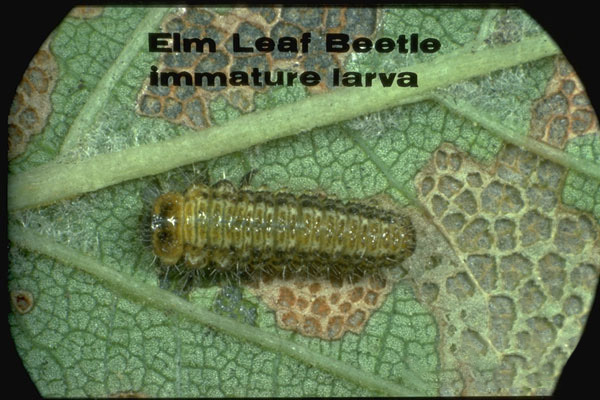 Both adult beetles and the larvae feed on the leaves of elms, resulting in complete skeletonizing of the leaves and possible complete defoliation of the tree once these leaves fall. The adult beetles vary considerably in their coloration of the wing covers, from yellow with dark green stripes running lengthwise to solid dark olive green in the form that overwinters. The head and thorax are yellow with small black patches on them, including a small “hourglass” pattern in the middle of the thorax. The adult beetles are about ¼ inch long and with a flattened profile. The mature larva is a dull brown color with two rows of tubercles running along the top of their body that give them a striped appearance. 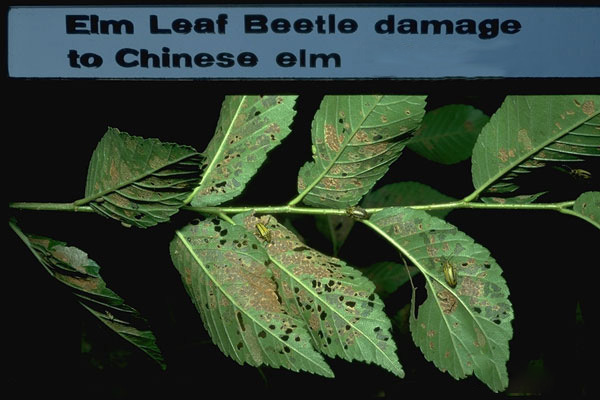 Elm leaf beetles can be killed with applications of residual insecticides made when the larvae or adults are present on the foliage. Systemic insecticides applied to the soil are also very effective by moving the active ingredient up the tree and into the foliage to be eaten by the feeding beetle larvae. 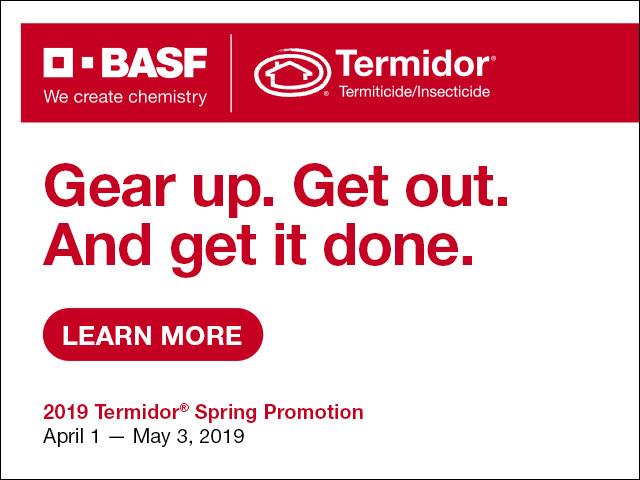 This application needs to be done well in advance of the presence of the larvae to give the active ingredient time to move up from the soil.